Today marked the first day of our 3D scanner training. Rob from Paperless Parts came down all the way from Nashua, NH fighting through the AM traffic to make it to our shop by 9 AM - a drive that took him 3 hours, so thanks go out to Rob for accommodating our schedule to make it here! Once he arrived, we set up the last bit of software on the laptop that comes with the package, brought it and the scanner out to the vehicle prototyping lab and got right to work. First, we calibrated the scanner, then checked the scanner saturation levels to assure a quality scan. After scanning a few small parts, Dave and I went next door to Factory Five to get a Mustang 8.8 rear end used in the FFR kits so we could get an idea of what it will be like to scan larger, more complex assemblies. Just as expected, scanning the rear axle is much faster than having to model the assembly by taking various measurements off of the axle, sitting down at the computer and drawing the parts, going back to the axle for more measurements etc. etc. It does take some time to get used to the scanner, and to capture enough of the finer details to later complete the model in the software package, but much easier than going through the measure, then draw process. 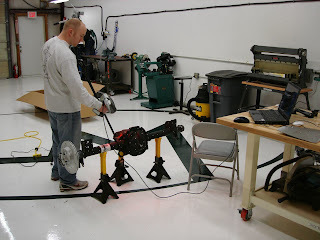 Here's a picture of me scanning the rear axle, which is instantly loaded into the computer. After our second day of training is complete, and the computer model has been finalized, I'll share some pictures of that process, but for now, this will have to do...sit tight! To expand a bit on Jay's post about our trip to the New York International Auto Show, not only did we see a lot of inspirational designs and equally as important - some very uninspiring designs, but we also had affirmation that we're on the right track. If you can't read what it says in the upper left-hand corner, it reads, "Meet our new supermodels." What!!!?? The two things that were most validating were the presence of not only alternative fuel vehicles, but specifically the use of diesel power in the lineup of just about EVERY manufacturer, and seeing the Hummer Hx concept in person. From seeing the models on the floor and talking to some reps (putting the actual engine we choose to use aside) our choice of a small but powerful V6 diesel engine is the right choice. Although one of our goals is to separate ourselves from the big manufacturers, in this case, using the same component is a good thing. It allows us a great deal of breadth in drive line componentry to choose from in the event that we run into an issue sometime in the future with something like supply issues of our engines let's say (Make no mistake - we are doing a great deal of research to prevent this, but it happens despite a great deal of forecasting beyond your control sometimes). More than that, from a marketing stance, it shows the shift in the power plant paradigm, so we are right on track to lead that shift. 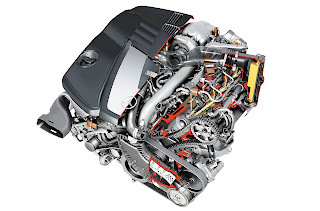 Many of the big manufacturers have not yet introduced their diesel engines and/or haven't made it available in their product lineup yet, but they will be within the next year or so. As for validating our choice of an innovative design for a performance off-road vehicle, that came not only in seeing the Hummer Hx, but from standing back for a while and just observing the reactions of the people passing by. Regardless of the demographic the response was the same - resoundingly positive and full of excitement. My initial impression upon first seeing it was how small it actually was, despite reading that it was GM's answer to the Jeep Wrangler. This wasn't a bad thing at all, but from the pictures I've seen of it, the design - everything from the big whees and tires, the aggressive fender flares, the distinctive Hummer front end - gives a much larger, more powerful feel to the Hx. That's Dave Riha (left, about 6' tall), and Jay (right, 6' 3"-6' 4") standing next to the Hx, which is on a platform of about 6"
The other thing that I was glad to see, was their use of space to incorporate a few neat features. As I've stated in a past post, the use of dead space is excellent, but the things they've filled the space with and where they're placed is very intuitive. In the driver door, they have a flashlight and a first aid kit - right were the driver can easily access them in a hurry, at night etc. rather than having to fumble through the rear compartment to find them. In the passenger door is a shovel - not always critical to have quick access to, but you can still reach it from the driver side of the vehicle so it makes sense to put this in the passenger door versus the driver door, not to mention up front rather than in the rear compartment buried somewhere. For these reasons and several more, our trip to the Auto Show was very inspiring and reaffirming. What we saw there will keep us focused on the track to manufacturing great cars in a simple but highly effective manner and avoid the complications that many larger manufacturers create for themselves to maintaining the right course. Although we saw many many samples of parts that were printed by the Z Corp machines when at their headquarters a few weeks ago, there's nothing like the feeling of printing the part yourself, removing it from the powder and performing the post-processing. When I came in this morning and I could just barely see the tip of the parts under the powder, I had no idea of how the parts would actually look. Were the colors correct? Did all of the parts stay together? How hard would it be to remove the powder? Once Gary arrived, Dave and I got right to work removing the parts from the printer. 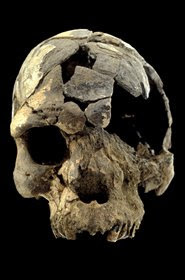 During the few classes of anthropology I took while in high school and in college, I had the opportunity to watch several videos chronicling site excavations of such finds as Otzi the "Ice Man" in the Italian Alps, and the oldest human remains ever found (at the time (2003) - 160,000 year old skulls found in Ethiopia). Much like when Dinosaur fossil remains are just barely noticeable on the surface, the extraction of the human artifacts began very carefully, using a brush to wisk away the dirt in order to preserve as much of the delicate remains as possible until enough of the dirt was removed that the fossil/remains/artifact could safely be removed. This was my initial impression as we began to brush the top layers of the powder in the build bin away from the parts we had just printed. Despite having seen what was underneath the powder on my computer screen (much like in-experienced archaeologists and anthropologists have seen pictures of certain fossils/remains/artifacts) the prospect of seeing the actual parts for the first time was really exciting. I'd like to say we were just as gentle as those scientists dealing with thousands of years old artifacts, but we weren't, so we did break a few of the parts!! The damage was minimal, but this was good learning for future "archaeological expeditions" of our own kind, when we are making parts that we will be using for the prototype. Next up is the 3D Scanner training! If you went to bed early last night, you missed two major accomplishments from the team here at Local Motors! The most critical step made was that the newly revised website went live after midnight, as referenced by one of our founders and CEO, Jay Rogers in his blog. Secondly, the Vehicle Engineering team began day one of a two day 3D printer in-house training course. After an overview of the machine from Gary Wentworth of Great Eastern Technology, installing the print heads, filling the binder bottles and aligning the print heads, we were ready to begin printing all within a few hours! After aligning the print head, we ran a test print to make sure the head was properly aligned and the color was correct - just like an inkjet printer at home, but we're printing on powder, not paper! Our parts are in the powder filling the build bin to the right. Introducing Local Motors' "Prototype Development Division"
About a week earlier than expected, the 3D printer (at left), depowdering machine (in the corner) and the scanner (not shown) arrived earlier this week! No candy or Easter Egg hunts needed for the engineering team this year...we already had our hunt rifling through the boxes as soon as they arrived to set up our new equipment. We are now officially the proud owners of a Z510 Printer and ZScanner 800. Now we just have to complete the training on how to use them so we can start cranking out the great designs we have planned (more on that next week). Thanks go out to Vehicle Engineer Dave Riha for setting up the machines, putting power to them and having everything set up so we can hit the ground running when Gary Wentworth of ZCorp arrives for the training. Thanks also need to go out to Jason Bassi for coordinating the efforts and to Gary for putting us in an earlier time spot than initially anticipated since the printer arrived early. At this stage in the game, most of our days involve the former, but it's necessary to keep in mind from the get-go that we're not in the business of DESIGNING one-off prototype vehicles, but rather, MANUFACTURING vehicles for production. The development process of that single prototype is a means to an "end" that is manufacturing vehicles over a sustained period of time. Therefore, everything that goes into the prototype has to be designed/manufactured with the notion that each part will not be the only one of its kind. Since there will be several hundreds and maybe even thousands (this is one of many topics within manufacturing engineering that I will dedicate a post to at a later date - that of limiting SKU's - since this is one of our main goals at Local Motors) of parts used to build each vehicle we need a way to track the part numbers, suppliers, costs, minimum order quantities, quantity per car etc. of each part to allow the manufacturing process to operate smoothly in an effort to run as close to a "Just In Time" manufacturing principle, which was first introduced by the great Henry Ford, who in my mind and the mind of many others is the father of modern production and manufacturing. As a result, we've spent a small amount of time out of each day to research MRP systems that will work best for Local Motors as we transition not only from development to production, but from facility to facility. To date, the best options seem to be the web-based systems which will allow not only our suppliers, but our various Local Motors facilities to view a common Bill of Materials and other reporting documents at anytime, anywhere. Two examples of such software, Infor and OpenPro could be very viable options since the software has the ability to be automated and customized for small to medium businesses. Also, since the software is web-based, it is generally less expensive than some other options where you have to purchase a hard copy of the software and install it - this is another winning aspect of web-based software for us since we do plan to have multiple locations...the IT guys will love this! As we get closer to production, we will take a much closer look at the available systems, but again, we feel that it's necessary to do some preliminary research so we can begin to compile our information in the correct manner so that the transition from development to production and from facility to facility is as seamless as possible. As the saying goes, "The devil is in the details," which is probably why the manufacturing facet of engineering is the less glamorous part of our jobs, but requires a great deal of attention to the smallest of details and can ultimately determine the success or failure of all of the design work that was done up front to get to the production phase. As an extension of yesterday's post on engines, I wanted to share some of the other options we're researching. These range from current production car diesel engines to newly developed engine systems that can support multiple fuels. 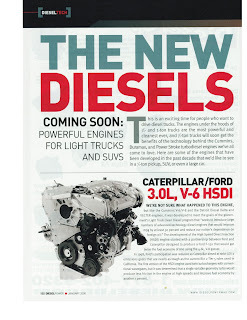 In addition to the aforementioned Mercedes-Benz Bluetec V6, other diesel engines available (or soon to be) for light trucks and SUV's include the Caterpillar/Ford V6 3.0L HSDI, GM V8 4.5L DURAMAX, and the CUMMINS V6 4.2L/V8 5.6L. All of these engines (and more) were recently cataloged in the January 2008 Issue of Diesel Power Magazine in an article titled, "The New Diesels." This article gives a very detailed description on performance specs of each engine, the applications, and some history on each. We will be following the development and availability of such "traditional diesel" engines during our development process. Alternatively, we will stick to our core values of being open minded and innovative in our approach to developing a new vehicle and a new car company as a whole and simultaneously continue research on alternative power sources. 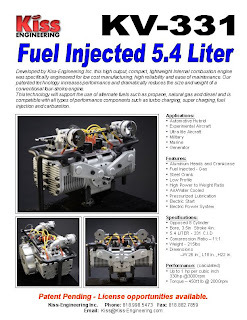 Two such power sources that have come to our attention are the Kiss Engineering KV-331, fuel injected 5.4L opposed 8 cylinder IC engine, and the Scuderi Air Hybrid Engine. The KV-331 is a lightweight (only 215 lbs for an 8 cylinder!!) 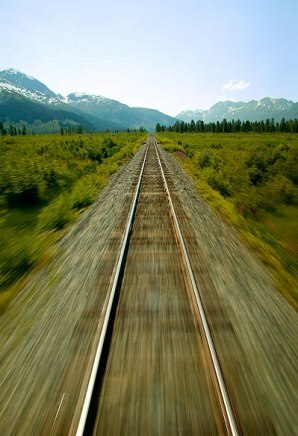 engine that can support alternate fuels like propane, natural gas, or diesel. It is also ready to accept such power add-ons as superchargers or turbos, and it's already putting out 330 hp stock! As for the Scuderi engine, I've mentioned that in a previous blog post, but to quickly recap, it's a technology using a split cycle where there are two cylinders: one for the compression stroke, and one for the power stroke. The compression cylinder can use air from a storage tank linked to the cylinders, which creates the same effect as using a supercharger. This system increases efficiency to 40% and also lowers the toxic emissions generated by up to 80%. Independent tests show it also has higher power, torque, and efficiency ratings under full load than standard turbocharged engines. You may be wondering why we haven't already just settled on one of these (or other) newer technologies if our goal is to deliver a game changing vehicle that offers today's consumer something they haven't been offered already and something that isn't currently available and started our research with the diesel technology. In order to maintain another one of our "mission critical" ideals of getting to market quickly, it may be our best option to limit unknowns (and keep cost low) for the first prototype and use the diesel, then transition to newer technology. However, we also plan to be innovative, so utilizing one of these new technologies is a very viable option for the prototype or for the next vehicle in the very near future. Stay tuned for more details. In the meantime, take a look at this video explaining how the Scuderi engine works. As you've heard me say in the past, it isn't just our engineering team that feels responsibility to design a stylish, multi-faceted vehicle with solid performance that also affects change in the way automobiles are manufactured, but the entire Local Motors team. This was reinforced today by one of our web developers, Andy Cronk. Despite being up until nearly 3 AM last night working on the semi-closed Alpha launch of the Design Competition web page, and compiling incoming data all day today from that launch, he made it a point to direct me to an article he read online about diesel engines and Detroit's inability to embrace the diesel market as a viable source of cleaner, more fuel efficient sources of automotive power here in the United States. The article also points out that consumers are a bit blind to the fact that diesels are not only 30% more efficient than gasoline powered vehicles, but maintain their value far better than gasoline powered cars. I have also mentioned previously the notion of automakers moving to smaller gasoline engines such as the V6 instead of V8 power and even the use of a V6 Diesel. The only one of the Big Three that offers such a V6 Diesel is the very same engine used in the Mercedes-Benz E320 Bluetec (Chrysler uses it in their Jeep Grand Cherokee). This is also one of the engines that we are seriously considering as our powerplant for the first Local Motors vehicle and possibly beyond. Make no mistake about it, the timing of our inception and the plan that has been put into action coinciding with this slow movement by large auto makers in the U.S. to make diesel powered vehicles more visible and more available in the U.S. is no mistake. Yet another example of a situation where "We do. They Don't." "Detroit will arrive to the party late, proving once again that for every inaction there is an equal and opposite market reaction. European and Japanese car companies will import their diesels and steal more of Detroit's market share." Add Local Motors to that list including the European and Japanese car companies stealing the diesel market share! I read a report today that the National Highway Traffic Safety Administration (NHTSA) is conducting an investigation into a reported brake problem with GM's Saturn Sky and Pontiac Solstice. More specifically, the performance grade versions, the Red Line and GXP, respectively. Why do both cars have the same problem you ask? The cars share the same brake control unit and turbocharged 2.0L engine among other components/systems. This is where designing for modularity can cause headaches for a manufacturer, particularly one that is already in trouble for numerous reasons, and now two (instead of one) of what are supposed to be some of their premier, top performing packages have their street cred being run through the mud. Not a good thing for any product line, but especially for a performance package where the owners are more than likely pushing the car to its limits on a regular basis and expect the performance to be on demand, especially the brakes! Being able to maneuver cars such as these at good amounts of speed around tight corners and along the straightaway gives the driver a great feeling, but certainly not when you hit the brakes and they aren't there like you'd expect them to be. I don't care if it's one of these 260 hp two-seaters or the 1000+ hp Bugatti Veyron - you've gotta have brakes! Something we'll have to bring some help in on for sure when it comes time to navigate the bureaucracy in Federalization of the Local Motors vehicles, so we don't run into this. Surely things like this affect the brand strength of juggernauts like GM, so for a small volume start-up manufacturer like Local Motors, it could be brand suicide. Even though it hasn't been that long since I've abandoned the archaic methods of conducting research, booking a trip, or finding out where a certain restaurant is, I have a hard time remembering exactly the channels I went through and how to navigate them. In the 2001 comedy about a pair of slacker friends and their misadventures, Jay and Silent Bob Strike Back, Jay asks what the internet is (to put it cleanly), and he's told in a sarcastic tone that it's "a communication tool used the world over where people can come together to [complain] about movies and share [illicit material] with one another." True to a certain degree I suppose, but very much more powerful than that, indeed. For example, today I was conducting some research on clay modeling. I was having trouble finding someone that can do this in Massachusetts, or even the east cost, so I put a post on a clay modeling forum (there's a forum for everything these days!) at ClayChat.com and within hours I had a few responses! And to both my dismay and pleasure at the same time, no luck with a contact from Massachusetts or even the east cost, but some contacts nonetheless. 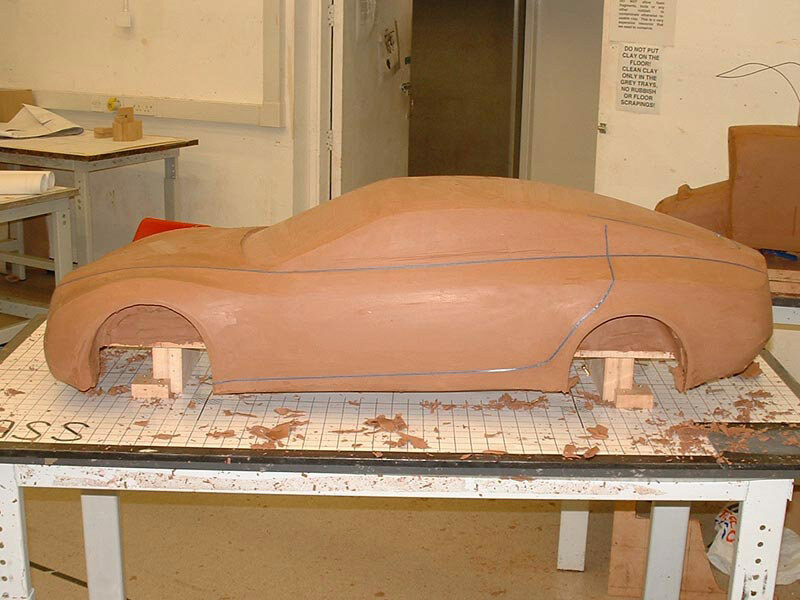 From these responses as well as research on other sites like CarBodyDesign.com, ClayModeller.com, it seems that a lot of this work can be done by freelance craftsman. We don't have a lot of space to make the bucks at our facility so I'm not sure about having someone come to our facility to make the model, but again, this was the very beginning of my research, so I will have to continue to search. Who knows how long it would have taken me to make contact with modelers from across the country, and a few overseas like I did today without the internet! Today was a historic day of sorts. Although it wasn't directly applied to the vehicle we're designing, I designed the first part at Local Motors with the newly installed SolidWorks 2008 software. After getting used to the new interface and setting up the tool bars etc. they way I like, I had a bracket we needed to mount the pressure regulators for the compressor in the shop drawn, cut (using the PlasmaCAM table at Factory Five), and bent in under an hour. This could have been done faster, but I made a few design changes after cutting the prototypes on the plasma table. Still, this would have been a far more arduous task if I had to cut them by hand, especially since the octagon hole had to be a very precise fit for the regulator to fit snug. It could have easily taken me 2-3 times longer if done by hand, and to be honest, it wouldn't have come out nearly as precise despite being pretty handy with a cutting wheel or plasma cutter. As we get into the heart of the development process, I'll have much more exciting drawings to share, but I thought I'd take a minute to acknowledge what today MEANT more so than specifically what I DID. A simple beginning, but a beginning nonetheless. Three absolutely amazing days in a row - that makes it a streak. Not to say we don't have great days every day here at Local Motors, but the last three have been without comparison for the engineering corps when it comes to making great strides in making the shift from "Orders Development and Transition" to Execution, as mentioned by Jay in the Founders Corner Blog this morning. We're very close to having our house in order - the band saw is now in the shop and assembled, the air compressor is days away from being fully operational and the down draft table is soon to arrive. Most importantly, the team spent the day today reviewing our schedule to be sure that we're armed with a plan and the confidence in that plan that will allow us to accomplish the several small victories necessary to meet the main objective of building a prototype. When asked what the two most crucial tools or weapons you would absolutely be crucial to your survival in the field of battle, Jay responded that they would be a radio and a map. The work done yesterday (and the days leading up to it) was critical in the formation of our plan, which will soon be put on a chart in an easily readable format, and displayed for everyone at Local Motors to see the critical path towards meeting our objective. This is clearly our "map". That takes care of one of our critical tools/weapons. It would be obvious to say that the radio for us would be email, a cell phone etc. Taking a more abstract approach however, each of those tools is simply a means of communication, which could be far more than email or a phone. It could very well be the scanner and prototype printer I mentioned in my last post. If we have the ability to scan and print parts to show suppliers exactly what we want, this could prove to be a highly effective mode of communication. However, we may already have that tool in the SolidWorks software itself since we can send 3D virtual models and 2D drawings to suppliers. Of course this isn't the only benefit to the scanner/printer combination as I've discussed previously, so just like when you purchase that all important cell phone - which was originally intended JUST for talking - you want to research the other capabilities of the phone and even different phones entirely to determine if it fits your needs/wants, your budget, the level of service the provider gives etc. More importantly though, you have to ask yourself if you really NEED all that stuff (ie: the iPhone)? Can you still succeed in your objectives with the tools you already have at your disposal? As we enter the field of battle these are the types of questions we are asking ourselves when it comes to purchasing tools/technology/services like the rapid prototyping scanner and printer to be sure we're armed with at the very least, the two tools that our survival depends on. We spent the day on site at Z Corporation to review their rapid prototyping scanners and printers. Just like adding SolidWorks, this is technology that could prove to be a core competency at Local Motors and very useful in meeting our prototyping time line at or above expectations, not to mention assist in the manufacturing process at the same time. After seeing the capabilities of using the scanner and printer both in tandem and by themselves, we now have more questions to answer in addition to those already answered today. 1) Just how much time would having the scanner affect my time in drawing existing parts vs. the current method of obtaining the part, taking measurements, then drawing it? 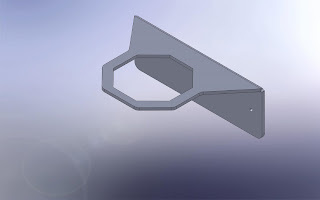 Furthermore, is having the ability to print a prototype (either of a part we design or reverse engineered) worth the cost of the equipment, space in the shop it will take up, could we use the capital for an alternative piece of equipment, training, or testing with a greater return? 2) This is a big one - How much of the cost is justified SOLELY by what we learn from having this technology in house? Can we make the decision now, without purchasing the equipment, that it's best to have someone else that has already been through the associated learning curve and implemented this technology create prototypes for us, or even purchase such a company while we focus on other aspects we consider to be closer to the intent of our mission? I could answer these questions and others that need to be addressed in regard to this issue now, but this is not a decision to be made only by the engineers - it isn't a question of whether or not the technology represents the technological prowess of Local Motors, but our ethos as well. If it doesn't represent the mission statement that governs the actions of the entire company, it deserves the input from each team member and we'll have to find another way to design our vehicles on schedule and within budget. In other words, the decision will be based on input from the entire team to make sure that the capital we've raised is used not only on the right technology, but the right technology at the right time. Exciting day today in the engineering world of Local Motors - SolidWorks is finally installed and up and running! Since I started this blog you've heard me speak of certain aspects that will be core to the success of our products. SolidWorks is the very nucleus of the engineering "cell". It maintains the integrity of of the vehicles we produce and houses much of the genetic make-up of each design. Design software, in my mind is the most important tool a manufacturing company (a small start-up in particular) can have. When paired with the right manufacturing technology, it allows the smallest of engineering teams to bring their ability to produce top notch products to a world class level while operating within the 80/20 principle and far beyond. The GTM we designed at Factory Five is a perfect example. 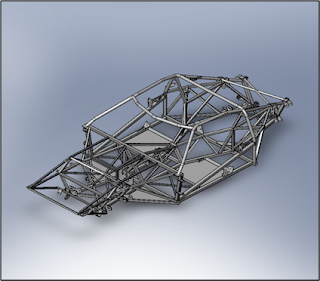 I designed the entire chassis and chassis jig in SolidWorks, sent the drawings out to have the tube steel and plate steel cut by our suppliers so when the parts arrived all the pieces "popped" together. 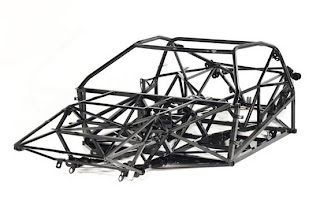 Without the design software, it would have taken countless hours for someone to order the steel, measure each piece (several of which are cut at compound angles), cut the steel, make the jig structure by hand, make sure the pieces fit and then somehow find a way to make the process of manufacturing each part easy to reproduce - definitely not 80% of the result for 20% effort. The exact opposite to be honest. This definitely is no way to get to market quickly, which is one of those key aspects you've heard me discuss in regard to the success of Local Motors. It's technology like 3D design software that enables that. I'm pretty pumped to have the software installed because this is where the real birth of the vehicle begins. Although I don't have children, the only way I can describe the feeling of seeing the results of the process required to go from the first picture above to the lower picture of the actual chassis is like raising a child knowing that you were influential in its make-up, being a part of each success and that a part of you lives as long as it does. A great sense of pride.